This guide provides a detailed comparison of private equityPrivate Equity Career ProfilePrivate equity analysts & associates perform similar work as in investment banking. The job includes financial modeling, valuation, long hours & high pay. Private equity (PE) is a common career progression for investment bankers (IB). Analysts in IB often dream of “graduating” to the buy side, vs venture capital vs angel and seed investors. It’s easy to confuse the three classes of investors, especially because they overlap a lot and the distinctions are not always super clear. 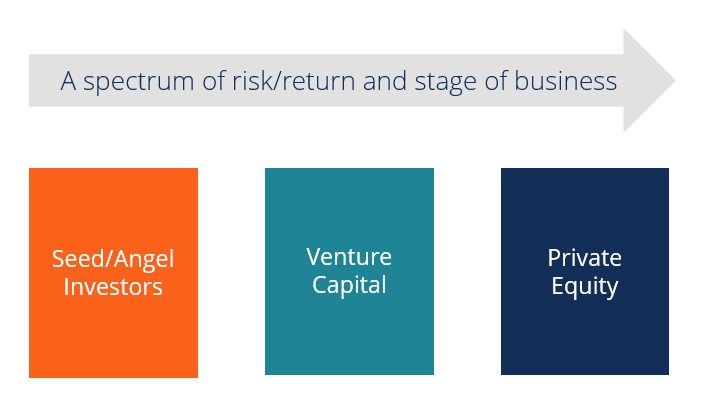 Below are the most important things you need to know about private equity, venture capital, and angel/seed investors. The easiest way to compare the three classes of investors is by viewing the table below. It provides a breakdown based on the stage of businesses they invest in, size and type of investment, risk/return profiles, their management teams, and more. As the names imply, “seed” or “angel” investors are usually the first investors in a business, followed by venture capital firms (think “new venture”), and finally, private equity firms. Angel or seed investors participate in businesses that are so early-stage they may be pre-revenue with few to no customers at all. They could simply have a well-developed business plan, prototype, beta test, minimum viable product (“MVP”), or be at a similar level of development. Some of the businesses, however, may have revenueSales RevenueSales revenue is the starting point of the income statement. Sales or revenue is the money earned from the company providing its goods or services, income or even cash flowValuationFree valuation guides to learn the most important concepts at your own pace. These articles will teach you business valuation best practices and how to value a company using comparable company analysis, discounted cash flow (DCF) modeling, and precedent transactions, as used in investment banking, equity research, (it’s not to say that they can’t have those things – it’s just that they frequently don’t). Venture capital (VC) firms typically invest in businesses that have proven their revenue model, or if not, at least have a sizable and rapidly-growing customer base with a revenue strategy in clear sight. Private equity (PE) firms invest when a company has gone beyond generating revenue and developed profitable margins, stable cash flow, and is able to service a significant amount of debt. To learn more about the various types of cash flow, read our ultimate cash flow guideValuationFree valuation guides to learn the most important concepts at your own pace. These articles will teach you business valuation best practices and how to value a company using comparable company analysis, discounted cash flow (DCF) modeling, and precedent transactions, as used in investment banking, equity research,. Seed and angel investors really have no minimum size, but typically it’s at least $10,000 to $100,000 and can be as high as a few million in some cases. Y Combinator, for example, typically invests $120,000 for a 7% ownership stake in companies accepted into its accelerator program. Venture capital firms can invest a wide range of values depending on the industry, company, and various other factors. As a rule of thumb, you can assume venture capital deals are, on average, anywhere between $1 million and $20 million. Private equity firms, being later-stage investors, typically do larger deals and the range can be enormous depending on the types of business. There are boutique, mid-market private equity firms that will do $5 million deals, while massive global firms such as Blackstone and KKR do billion dollar deals. The range is so wide it’s almost meaningless to put an average on it. Angel/seed investor can only invest equity, as the businesses they are targeting are so early stage that they’re not suitable for debt. In extremely early stage deals they may use an instrument called a SAFE, which stands for Simple Agreement for Future Equity. This is an alternative to a convertible note. In exchange for money, the company gives the investor the right to buy shares in a future equity round (with specific price parameters). Most deals, however, are simply done as straight up cash for shares. VC firms invest common equity, preferred shares, and convertible debt securities in companies. Their focus is on equity upside, so even if they invest in a convertible debt security, their goal is to eventually own equity. Preferred sharesCost of Preferred StockThe cost of preferred stock to the company is effectively the price it pays in return for the income it gets from issuing and selling the stock. Download the free calculator template to determine the cost of preferred stock based on the company's preferred dividend payment, share price can have all sorts of special rights and privileges to protect investors by limiting their downside (first out) and protecting them from future dilution of equity interest (rights/warrants/ratchets). PE firms typically invest equity, but also borrow a significant amount of money to enhance their levered rate of return (internal rate of return IRRInternal Rate of Return (IRR)The Internal Rate of Return (IRR) is the discount rate that sets the net present value of an investment equal to zero. This guide to calculating IRR will give several examples and who why it's used in capital budgeting, private equity and other areas of finance and investing. If IRR is greater than cost of capital,). They may undertake a transaction known as a leveraged buyout LBOLeveraged Buyout (LBO)A leveraged buyout (LBO) is a transaction where a business is acquired using debt as the main source of consideration. 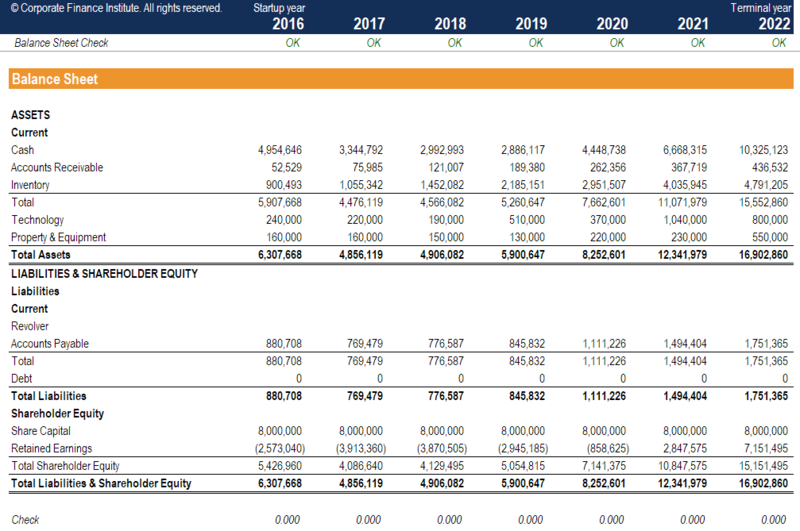 An LBO transaction typically occur when a private equity (PE) firm borrows as much as they can from a variety of lenders (up to 70-80% of the purchase price) to achieve an internal rate return IRR >20% where they maximize the amount of debt they can use in the deal. Seed or angel investors are typically entrepreneurs who founded their own companies and had successful exits. Their main skillset is understanding the role of the entrepreneur in the business, and they often have very specific product knowledge. Venture capital investment teams are often a mix of entrepreneurs and ex-investment bankersWhat do Investment Bankers do?What do Investment Bankers do? Investment bankers can work 100 hours a week performing research, financial modeling & building presentations. Although it features some of the most coveted and financially rewarding positions in the banking industry, investment banking is also one of the most challenging and difficult career paths, Guide to IB or other types of finance professionals. For example, a16z hires a wide range of entrepreneurs and professionals as you can see in their a16z team profiles. Private equity firms are typically more weighted towards ex-investment bankers and corporate developmentCorporate DevelopmentCorporate development is the group at a corporation responsible for strategic decisions to grow and restructure its business, establish strategic partnerships, engage in mergers & acquisitions (M&A), and/or achieve organizational excellence. Corp Dev also pursues opportunities that leverage the value of the company’s business platform. types, or experienced corporate operators. This part is fairly straightforward. The earlier the stage the business is in, the higher the risk (as a generalization – there are exceptions, of course). One thing that can skew level of risk is leverage and financial engineering. While Top Private Equity firmsTop 10 Private Equity FirmsWho are the top 10 private equity firms in the world? Our list of the top ten largest PE firms, sorted by total capital raised. Common strategies within P.E. include leveraged buyouts (LBO), venture capital, growth capital, distressed investments and mezzanine capital. may typically invest in lower risk enterprises, if they use excessive leverage in acquiring a sizeable equity interest, then the investments can become very high-risk. All three classes of investors are trying to earn the highest possible risk-adjusted rates of return. That goes without saying. Given the different risk profiles though, we can observe that, on average, seed investments can return 100x or more when they work (they often go to zero), while later stage VC returns may be more like 10x (fewer of them go to zero). PE firms seek 20% or higher IRRs (only a very small number of investments go to zero). There is no real, identifiable industry distinction between the three classes of investors. Private equity vs venture capital vs angel/seed investors vary so widely by industry that they can only be assessed on a firm by firm basis. Angels and seed investors focus more on qualitative factors such as who the founders are, high-level reasons why the business should be a big success, and ideas about product-market fit. PE firms look at key financial metrics, including EBITDA, cash flow, free cash flowValuationFree valuation guides to learn the most important concepts at your own pace. These articles will teach you business valuation best practices and how to value a company using comparable company analysis, discounted cash flow (DCF) modeling, and precedent transactions, as used in investment banking, equity research,, and, ultimately, what IRRInternal Rate of Return (IRR)The Internal Rate of Return (IRR) is the discount rate that sets the net present value of an investment equal to zero. This guide to calculating IRR will give several examples and who why it's used in capital budgeting, private equity and other areas of finance and investing. If IRR is greater than cost of capital, they believe they can achieve. To learn more, see our business valuation fundamentals course now! Let’s take a look at firms that operate in private equity vs venture capital vs angel and seed investing. As you can see, there are many differences between private equity vs venture capital vs angel investors. The primary identifiable difference really comes down to the stage of businesses they invest in. Everything else tends to blur across the three categories. When it comes to skill sets and career paths in all three types of firms, expertise is required in extensive financial modelingWhat is Financial ModelingFinancial modeling is performed in Excel to forecast a company's financial performance. Overview of what is financial modeling, how & why to build a model. A 3 statement model links income statement, balance sheet, and cash flow statement. More advanced types of financial models are built for valuation, plannnig, and and valuation methodsValuation MethodsWhen valuing a company as a going concern there are three main valuation methods used: DCF analysis, comparable companies, and precedent transactions. These methods of valuation are used in investment banking, equity research, private equity, corporate development, mergers & acquisitions, leveraged buyouts and finance. If you’re looking for an edge in the job marketplace at investor firms, be sure to check out our online financial modeling courses, where you learn to build models like the one below from scratch.